Medium length hair is the best! 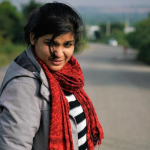 It’s perfect for women who don’t want short hair but can’t handle long hair. Medium length hair can be anywhere between shoulder level to about 3-4 inches below it. Most women with hair this length leave their hair open and unstyled, but there are many hairstyles that can make it look spectacular. For instance, adding bangs can change your look completely. 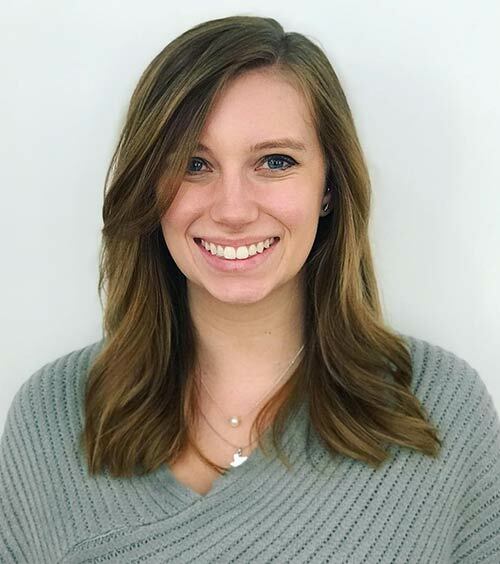 Before you go through my list of the best medium length hairstyles with bangs, you need to know that picking the best bangs depends largely on your face shape. So, read on to know which bangs you should go for. If your face is circular and the fullest parts of your face are the cheeks, you have a round face. Most round-faced women have small faces because the width of their cheeks is longer than the length of their face. 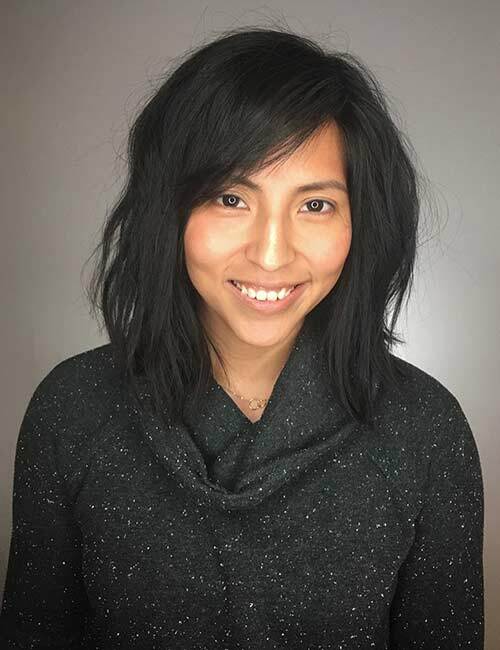 If you have a round face, an arching straight full fringe that falls just below the eyebrows adds softness and complements the face structure. Deep side bangs also work. If your jawline and cheekbones are equal in width while your forehead is narrow, you have a square face. Your jawline will be box-ish. The width and length of your face are equal. Keep your bangs straight and just below the eyebrows. 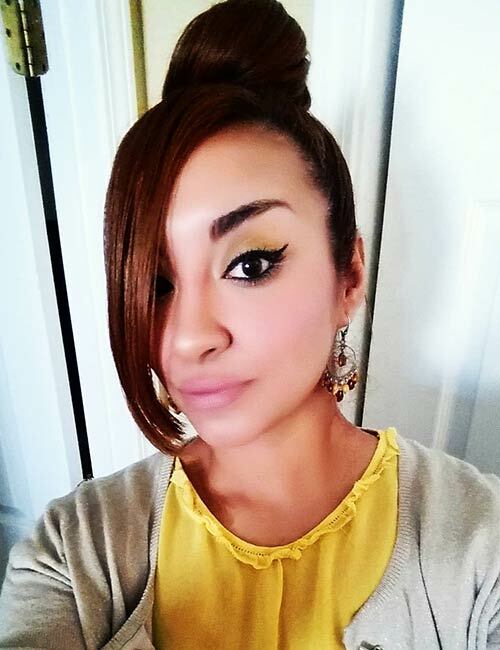 Straight bangs that are feathered in the center create an even look and accentuate your face. If your jawline is pointy, you have a diamond face. Your cheeks are the fullest part of your face while your forehead and jawline are narrow and almost similar in width. Long side-swept bangs go well with this face shape. This face shape is almost egg-like. The face is long, but the cheeks are the widest parts. The jawline and forehead are the narrowest parts of the face. All bangs look great on an oval face. Though the forehead is the fullest part of this face shape, it narrows towards the top. This face shape also gradually tapers as it reaches the chin. Arched side-swept bangs that are longer at the sides look amazing on heart-shaped faces. The forehead is the widest part of this face shape. Side-swept bangs, side bangs, feathered front bangs, and deep side-swept bangs look great on this face shape. Blunt or baby bangs might not go well with this face shape. The jawline is the widest part of this face shape while the forehead narrows near the hairline. You need to focus on softening the jawline and drawing attention to the forehead. Layered bobs, fringed bangs, choppy layers, and long hair with layers beginning at the temples are the most flattering styles. The whole point is to make your cheeks and forehead appear wider to make your facial structure look more balanced. The length of this face shape is greater than its width, which means that the jaw and the forehead are long. If you have a long face, short bangs are a no-no as they will draw attention to your forehead. Try long bangs with either a full center or swept to one side, and we promise you will look amazing. If you have a high forehead, full side-swept bangs are the way to go. Let the bangs start near your eyebrows and taper as they reach the sides of your face. If you have a short forehead, consider getting a sloped fringe that is longer on one side. It is a deeply swept side fringe. Having bangs is not a joke. You have to take the commitment seriously if you want them looking lively at all times. Here are a few tips to get your fringe game on. You’ll need to style your bangs every morning. Bangs that are not styled right can look bad. They need to be trimmed every 2-3 weeks. 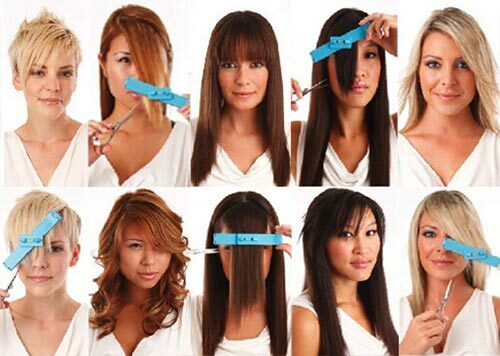 Be aware of your hair texture as it will help you understand what kind of bangs you want. You will need to wash your bangs every alternate day. Now that you’re ready to commit to bangs, here are the different types you can choose from. 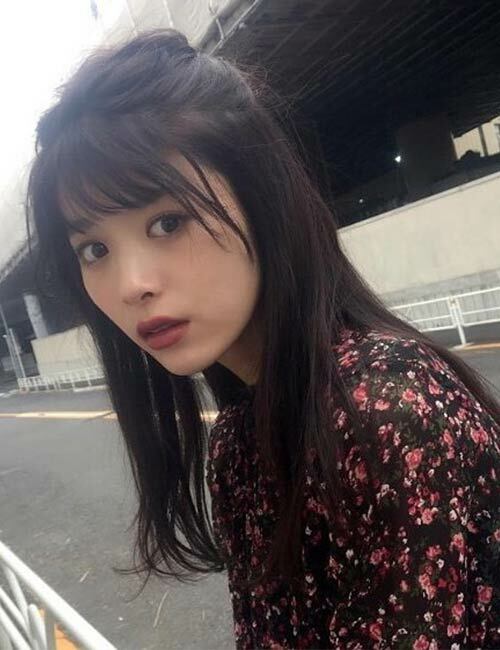 These are thick front bangs that are cut in one length. They look great on oval and oblong faces. 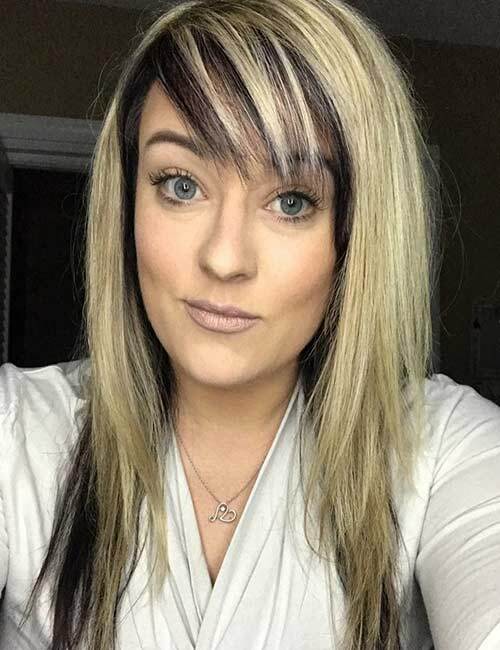 The best length for these bangs is just grazing the eyebrows. These are bangs that vary in length. If you have front bangs, they can be short at the center and gradually increase in length on the sides. They can also be choppy, like a mix of short and long. Side-swept bangs are bangs that are all swept to one side. Side-swept bangs look amazing with short curly hair. If you are considering a pixie haircut, try this hairstyle. 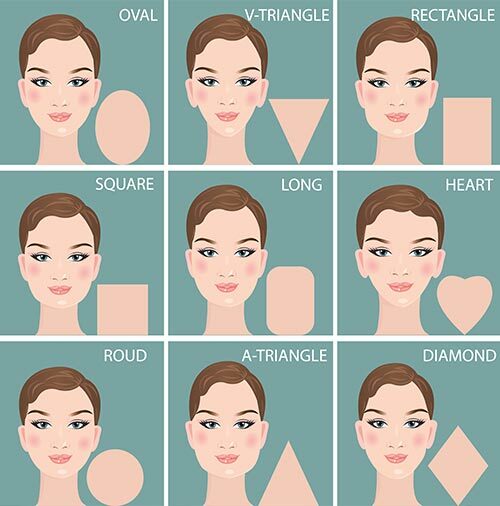 If you have a round or heart-shaped face, this is the style for you. These are bangs that loosely drop to the sides. They help in making a face appear slim. If you have a round face, these are a good option for you. While not many women go for curly bangs, they are incredible and the best way to show off your curls. If you have a broad forehead or a round face, consider these bangs. The coils make your face look slim and conceal the complete length of your forehead. These bangs look great on square faces as well. For all the women out there who love to do things on their own, here are a few methods to cut your own bangs. The first time might not deliver the best results, but remember – practice makes perfect. Before we start, here’s a helpful tip – never cut bangs when your hair is wet. Wet hair is longer than dry hair. So, when you cut your hair wet, you might miscalculate the length and end up with shorter bangs. Therefore, cut your bangs when your hair is dry and then wet it before you style it. The primary difference between cutting side and front bangs is the angle at which you cut your hair and how you shape your hair. 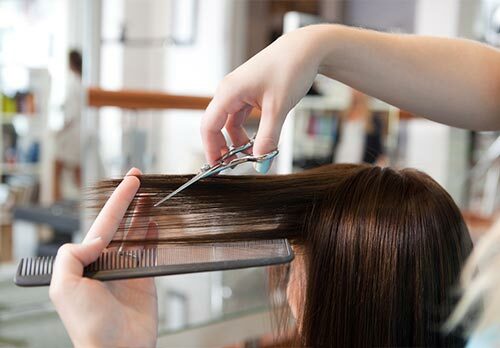 Comb the front part of your hair outwards and cut it diagonally from inside to the outside. This is pretty simple. Comb your hair and then cut it straight across. 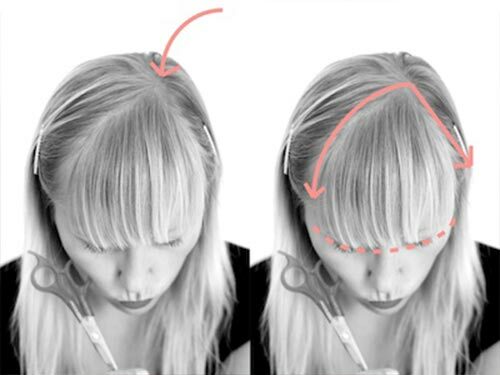 There are quite a few ways that you can cut your bangs like a pro. Here are a few of them! If you want a full center bang, pick up a triangular section from the front portion of your hair using a rat tail comb. Cut it evenly. If you want them tapered, cut the section just below your eyebrows and increase the length as you reach your ears. The best way to create a side parting is to make sure its aligned with your eyebrow. That way, when you cut your hair, it is adequately cut and not messy and all over the place. Once you’ve created the parting, begin cutting the rest of the fringe a little longer, giving it a tapered look. If you don’t want to cut your lovely locks but still want to try bangs, don’t worry! You have two good options. With the entrance of hair extensions comes the entry of the bang extensions. These are basically clip-on bangs. 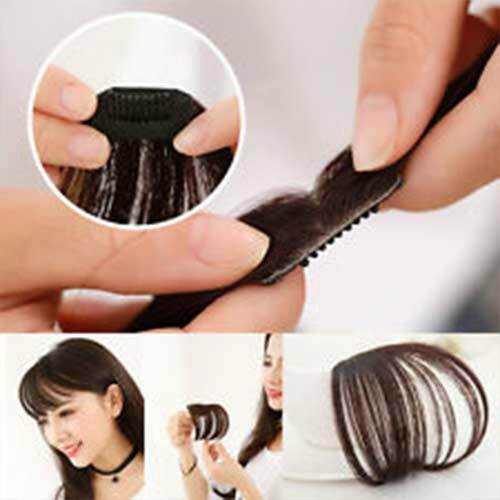 All you have to do is simply clip the bang extensions into your hair. Don’t feel like cutting your hair but want bangs? We have got the perfect solution for you! You can use extensions or merely try faux bangs. You’ll need elastic bands, pins or clips, and (depending on how you want the bangs to look) a curler. First, tie your hair in a high ponytail. 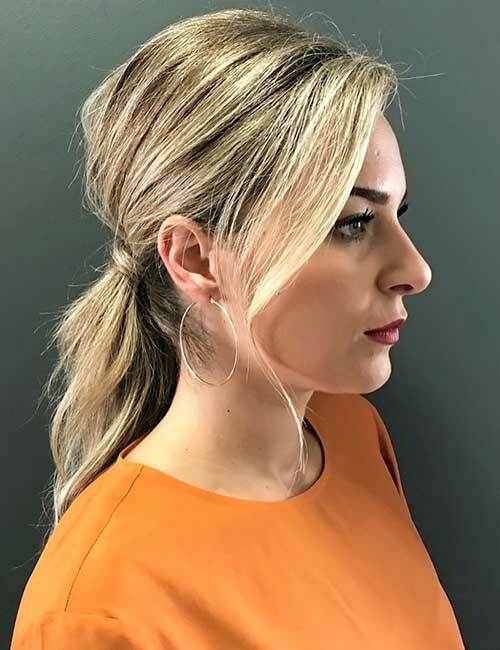 Pull the top section of the ponytail (one-third of the ponytail that will make the bangs) towards your forehead and use some pins to fix it in position. Roll the remainder of the ponytail into a messy or sleek bun. Fluff up your front hair to give it the perfect faux bang look. The key to having good bangs is to take good care of them. Yes, just like the rest of your hair, your bangs need to be maintained. Here are the best tips o maintain your bangs so they look flawless. Wash your bangs regularly. You don’t have to wash your entire hair when doing so. Your bangs can collect dirt and become greasy faster than the rest of your hair. Wash them every alternate day with a shampoo that works well for your hair. Trim your bangs regularly to keep them looking great. Watch your bangs when you moisturize your face. Make sure you don’t get any cream on your hair. The ingredients you use to moisturize your face might not be suitable for your hair. Oil your hair with warm oil and keep it on for an hour before you wash it. This is crucial for regular nourishment. 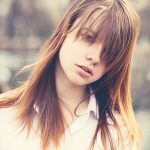 Now that you know how to choose, cut, and maintain your bangs, here are 20 wonderful medium length hairstyles with bangs. Read on to pick your favorites! Messy wavy hair looks incredible. It is perfect for those hot summer days. The lightly feathered bangs along with wavy hair draw the attention to your eyes. They cover your forehead and cheekbones, making your face look smaller than it is. If you have a round or heart-shaped face, these bangs will look great on you. The light color tones at the ends lend it a sunkissed look and make the jawline look slim. Wavy hair looks voluminous and luscious. 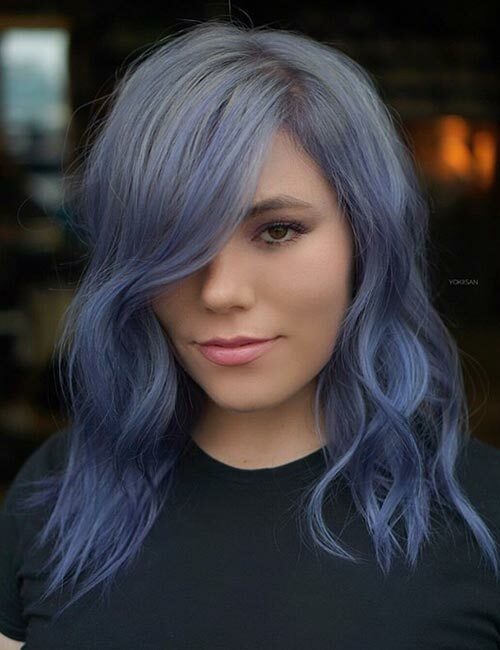 The ashy colors in this hairstyle also make it look full and lush. The frontal bangs cover the height of the forehead, while the split in the center shows just enough of the forehead to make it appear wide instead of large. The dark to light ombre is the best for framing the face. This hairstyle is simple but classic. 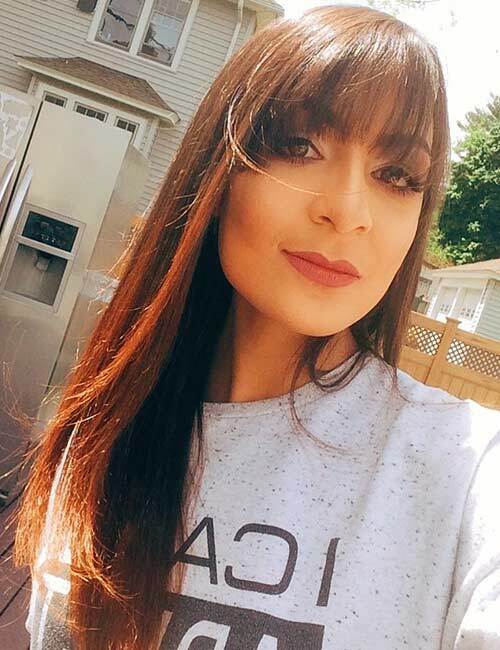 Long side-swept bangs with medium length hair look good on all face shapes. If you have a broad forehead or wide cheeks, the long side bangs can cover them up, giving your face a slim look. 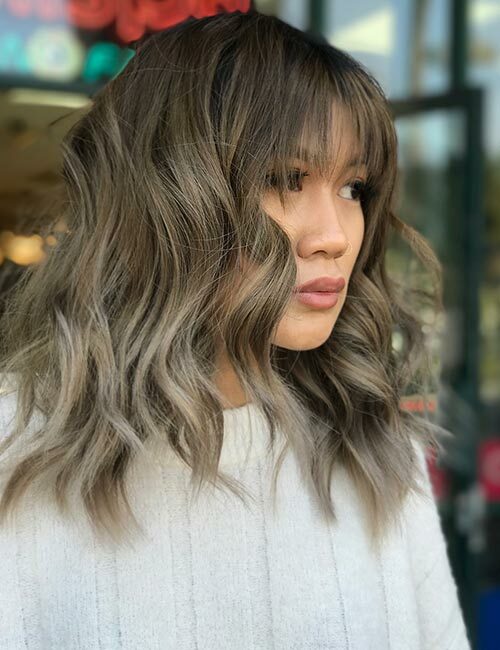 Adding lighter colors to your darker hair (and vice versa) is a great way to showcase your natural hair and also give definition to your facial features. This grunge hairdo works the best for teens and young adults. The deep side bangs and straight layers make this hairstyle the perfect emo look for blonde locks. Deep side bangs make the cheeks appear smaller than they are, while the layers soften and elongate the jawline. The dark, smokey eyeshadow totally ups the dramatic effect. The lob is one of the most highly coveted hairstyles of this day and age. But if you have a circular or large face, consider getting bangs with this hairdo. Deep side-swept bangs help make your face look slender and long. They also draw attention to your eyes. Eye-grazing front bangs are the best. These bangs make a long face look small and proportionate, and keep the focus on the eyes, cheekbones, and mouth. Straight hair accentuates the face-framing effect of these bangs. If you have a chiseled jawline, this hairstyle will showcase it well. 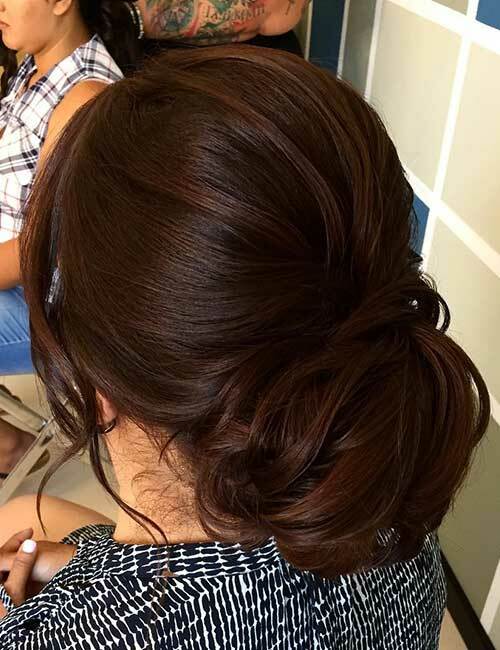 This low bun with side bangs is perfect for formal events. Detangle your hair entirely and tie it in a low ponytail, leaving the side bangs to fall freely. Using a curling iron or a straightener, curl your hair (bangs included). You want the curls to be light curls and not tight ringlets. Place a chignon bun maker just above the ponytail and start pinning sections of hair over it. Make sure the bun maker is the same color as your hair. 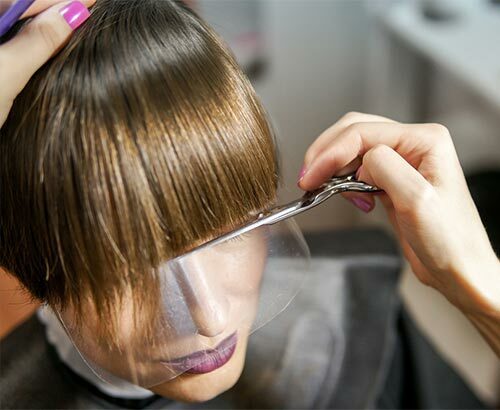 If you have a round or heart-shaped face, the side bangs will slim your face down, and if you have a square or rectangular face, the side bangs soften the lines of the face. This textured haircut is all the rage right now. One side of your hair is cut shorter than the other. You can decide how short and how long you want your hair to be. This hairstyle adds dimension to your face. The long natural side-swept bangs slim down the face and bring lateral attention to the face, focusing on the eyes, eyebrows, and mouth. The height added by the hair at the top of your head makes your face look longer. 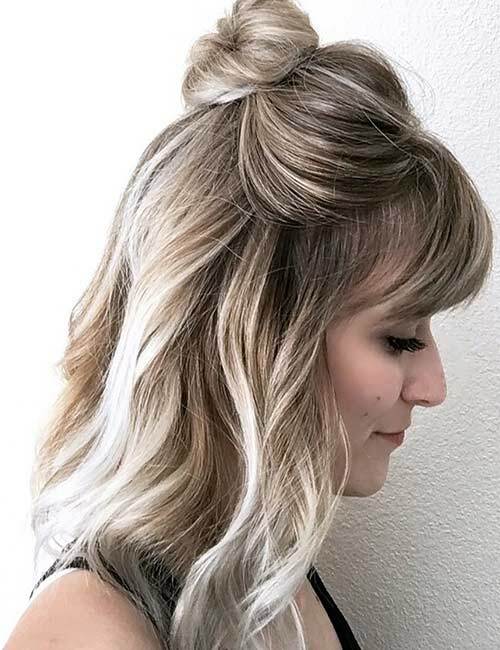 A high bun updo and simple side bangs come together to create a lovely look. Roll your hair into a high bun or try an exquisite bun updo to amp up this look. The side bangs frame the face well and soften a harsh facial outline. This hairstyle makes your forehead appear small and keeps the focus on your eyes. This hairstyle is easy to do. 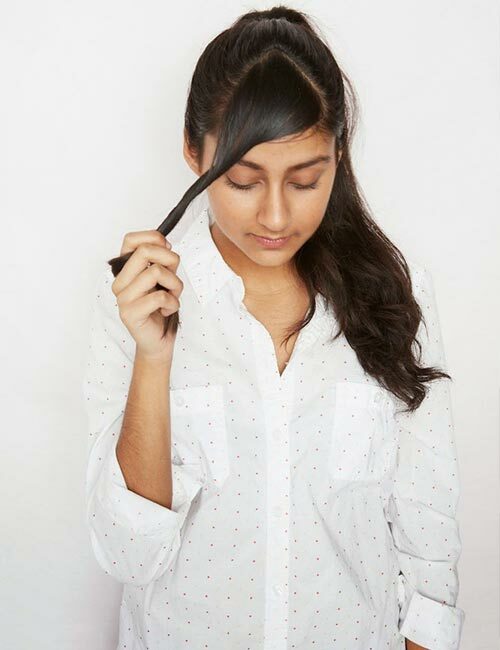 Comb some hair from the front and sides, hold it at the center of your head, and push it up and pin it in place. When you push it up, the hair on top creates a slight pouf, which adds length to your face. The front eyebrow-grazing bangs with long sides frame the face well by drawing attention to the eyes and jawline. 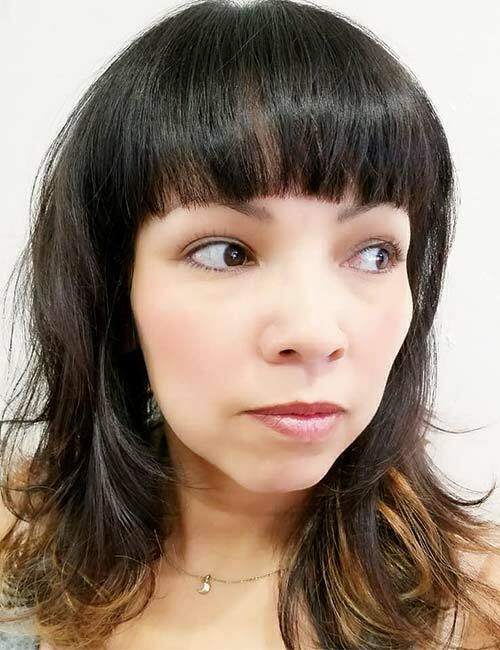 If you are tired of your front bangs simply falling on your forehead, try parting the bangs at the center to make them look like side front bangs. The half top-knot is a perfect ready-for-work hairstyle that is suitable for all face shapes. Bangs aren’t limited to the straight kind alone. Play around with them. These side-swept bangs curled at the end are a perfect example of how to style your bangs. If you have a diamond or square face, make sure your side-swept bangs are long so that the curls fall near the jawline. 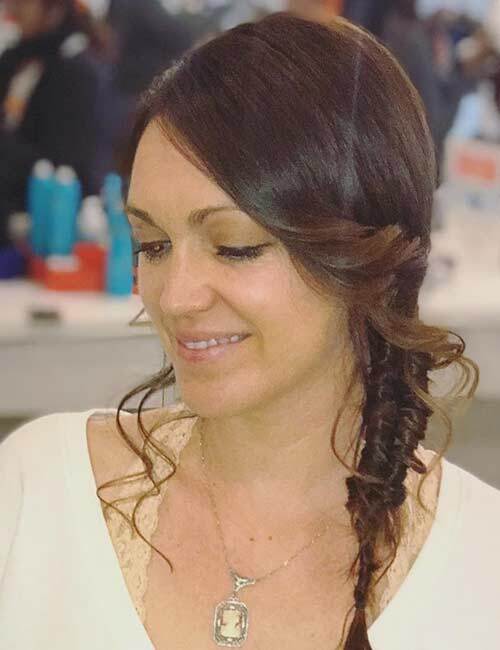 Instead of a regular braid, try this fantastic fishtail braid that is easier to do than it looks. Bangs and low ponytails go very well together. Comb your hair and push it up a little before tying it tightly into a low ponytail. The push creates a pouf at the top, which adds a creative turn to the simple ponytail. The color accentuates the texture of your hair. The side-swept bangs add elegance to the whole look while also focusing on the cheekbones and eyes. If you have high cheekbones, this hairstyle is a great way to flaunt them. The layers soften your face and make it look longer than it is. The light colors add texture to your hair and frame your face nicely. If you’re considering coloring your hair, try two shades lighter or darker than your original hair color as it will make your eye color pop. If you’re bored of your shoulder length straight hair, this hairstyle is a great way to spruce things up. It is incredible how some subtle color and curls can add life to your hair. Yes, color your bangs! It will make your eyes pop. That tilt at the end gives this look a whole new vibe. If you have a long face, the deep side-swept bangs will make your face look short and proportioned. Embrace your curls! 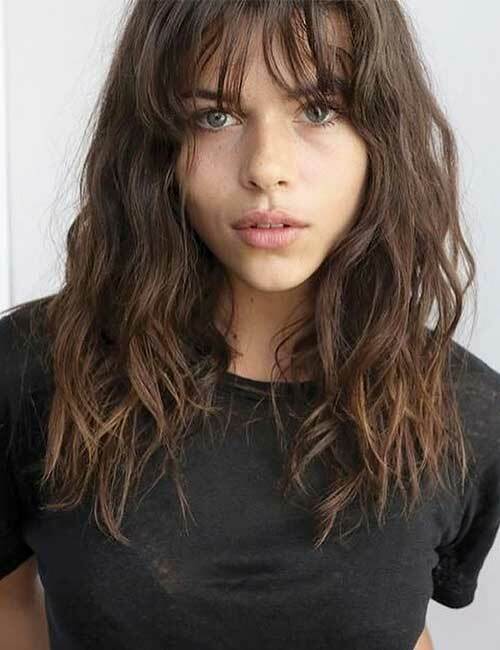 Curly bangs look great on all face shapes, but fine-textured curly bangs might not look that great on round or large faces. Thick blunt bangs falling on your forehead will look great on oval and long faces. If you have a round face or a heart-shaped face, stay away. These thick bangs take the attention away from the forehead and focus on the cheeks. The shag haircut and light ends make your face appear pointy at the jawline, giving it a chiseled look. If you have straight hair, there are so many ways you can spruce up your look. Deep side-swept bangs are not only simple to do but can also change your look completely. These bangs focus on the eyes and jawline. If you have a long forehead, these bangs will cover it. Blunt haircuts don’t suit round faces, but adding highlights can help in redefining your face. Nothing adds more pizzazz to bangs than waves. Change your entire look with this lush curly ends hairstyle. It adds volume to your hair, which, in turn, makes your face look smaller than it is. The bangs draw attention to the jawline. Adding color to your bangs can help redefine your facial structure. You can go for something simple like a hair color that is two shades lighter or darker than your natural hair color. But if you like bold looks, try this monochrome look. The bangs here are tapered, which attracts focus to the eyes and cheekbones. The colored layers soften the jawline and give it a more squarish appearance. These are the 20 most incredible medium length hairstyles with bangs. Try them out to spice up your look and let us know which ones you loved in the comments section below.